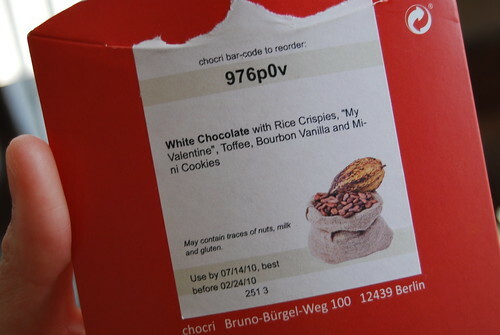 What kind of person gets themselves chocolate on Valentine’s Day? This person. (Points to self.) 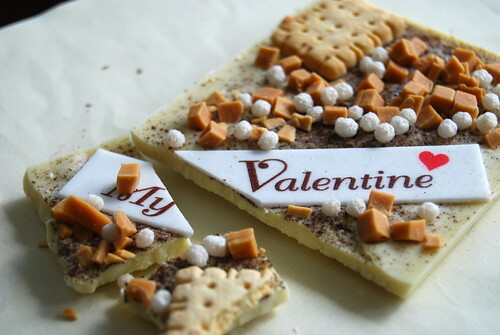 And with no fault of my husband who has gotten me heart-shaped boxes of chocolate in the past, I simply hinted that I wanted nothing special for Valentine’s Day — the day where every other person gets a box of chocolates and maybe even flowers. I side with the single person on this day. Chocri Chocolates is a Web site devoted to making the perfect chocolate bar according to your specifications. With a base of either milk, white or dark chocolate and up to six different toppings, the possibilities are endless. The downside? Each bar comes in at a base price ($1.90 for white, $2.90 for milk, $3.90 for dark) and each additional topping adds on the the cost sometimes up to $15. For one bar! It is truly decadent. But did I tell you that you can put whatever you want on it??? 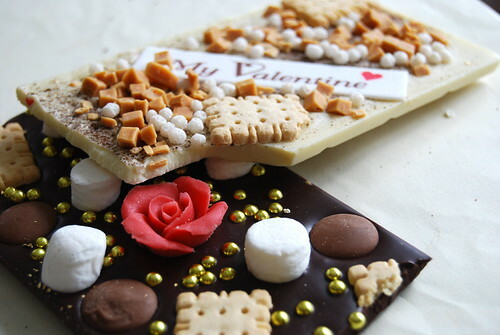 Like a marzipan rose surrounded by gold dragees, mini cookies, marshmallows and caramel drops? Totally a pimp chocolate bar if I do say so myself. Toppings include anise, chives, salted pretzels among many others. The only way to eat this bar is very slowly and savoring every component of it. Now only if they would make purses you can customize yourself. Those are beautiful chocolates! 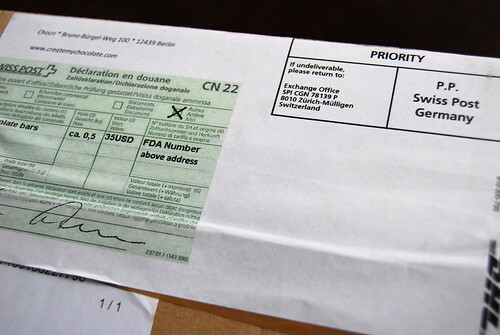 Quite an idea – ordering chocolates for yourself weeks in advance – and from Berlin to boot! Talk of being kind to oneself! That is the funniest chocolate bar I’ve ever seen. It reminds me of crafting in elementary school. And like elementary school, I want to put it in my mouth ;p How did it taste? The chocolate bar is SO GOOD! Delicious even! Miles better than Herseys or even dreaded Russell Stover. But isn’t it so pretty?